Although I enjoy reading romantic suspense, I usually write historical romance (medieval and the American Old West eras). Every now and then, another type of story calls out to me. 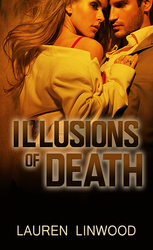 That was the case with Illusions of Death, my second romantic suspense novel. I envisioned a serial killer who would be impossible to catch because he had no set murder pattern. He kills victims from every gender, race, and socio-economic background—and equal opportunity killer! I enjoy thrillers that have some type of historical connection. Steve Berry and Brad Meltzer do a fabulous job of weaving history into action-packed stories that keep a reader guessing till the very end. Elizabeth Bennet from Pride and Prejudice gets my vote. Lizzy is intelligent, compassionate, loyal, witty, charming, and feisty—everything I love in a heroine. I’m excited to share that I’m launching my first series after nine standalone novels. The Knights of Valor series will debut with Word of Honor in April, followed by Marked by Honor in July and Code of Honor in October. Three more books from this medieval historical romance series will be released in 2017. Best-selling author Karlyn Campbell is ready for a new start after her recent divorce from a temperamental artist. When she receives word that her father had a stroke, she heads for Walton Springs with mixed feelings. Broderick Campbell wrote Pulitzer Prize-winning literary novels and denounced his daughter’s work as pedestrian and commercial, causing a rift that finally heals on his deathbed. Karlyn chooses to stay in the small Georgia town to write her popular Matt Collins series and decides to try her hand at true crime when Atlanta’s Rainbow Killer, Roy G. Biv, captures her interest. Detective Logan Warner’s marriage didn’t survive after he lost his twins to a crazed killer who was never caught. He returns to his hometown’s police force and runs for police chief, happy he’s escaped big city crime and corruption. Emotionally dead, his interest in life is renewed when he falls in love with Karlyn and begins to build a new life with her. But the Rainbow Killer moves beyond Atlanta, leaving a trail of dead bodies painted in bright hues in several towns north of the city. Leaving no trace evidence or DNA and choosing random victims with no apparent rhyme or reason, Roy proves unstoppable. Then he arrives in Walton Springs, threatening the peaceful town with his murder spree. With a serial killer in their back yard, Logan and Karlyn unite with the FBI to find the killer—before he finds them. Oooh, I can't wait to read this. :) Welcome back, btw! Thanks for such a fun interview, Kayelle! I hope you & your readers will enjoy the cat & mouse games that the Rainbow Serial Killer plays with Logan & Karlyn.